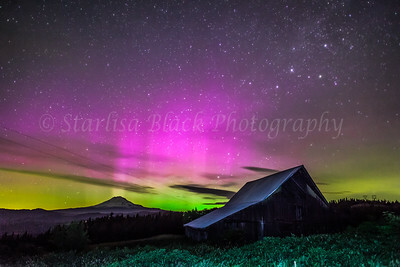 My First Aurora "After Midnight"
I have always been fascinated by weather. When I was young, I loved to run outside and dance in the rain, or stand on the porch and watch a thunderstorm. 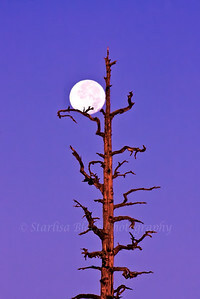 At age 22, I worked for the summer in the Nestor's Peak fire lookout tower near Husum, Washington. My first night on the job I was in the middle of a huge thunder and lightning extravaganza,. My job was to stand on a little stool on wheels that would insulate me from the tower in case the lightning hit, while propelling myself back and forth across the room making a mark on the windows in the direction and location of all the lightning strikes. That was an exciting night, with slashes of marker on every window. Back in about 1982, in the spring, I was briefly in Sandpoint Idaho. Late one night coming home after an evening dancing with friends, I got out of the car, looked up at the stars, and nearly fell over in surprise as wave after wave of color rippled over my head as I peered up between the trees lining the streets. I thought I was hallucinating! My friend looked up and exclaimed, "Northern Lights!" I was hooked. I have never seen them quite so brilliantly since then, but I keep hoping. In the mid 90's I was laying in a field on a summer night outside our house in Port Townsend, and once again waves of color passed overhead, although not as brilliant. 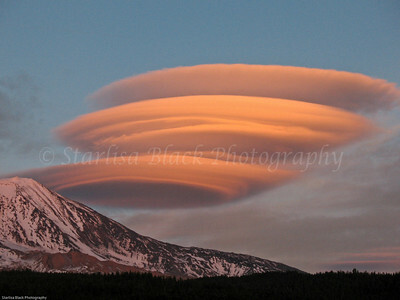 Meanwhile another obsession was growing: Lenticular clouds! Even as a child I loved these disk shaped clouds. 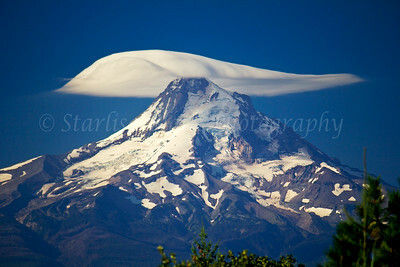 My Mother would point to Mount Adams or Mount Hood and exclaim, "Oh, LOOK at the cap she is wearing today!" I pretty much took them for granted back then, we were always watching the clouds. 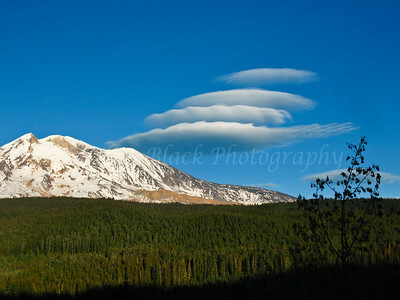 Years later in 2007, after getting my first little digital point and shoot camera, (a Canon Powershot A630), I captured my first and still most unique photos of lenticular clouds near Mount Adams. A year later, with my first DSLR camera I caught another massive stack of what I began to affectionately call "Lennies". I would send them in to the local news, and Bruce Sussman would often show them on KOIN 6 weather. 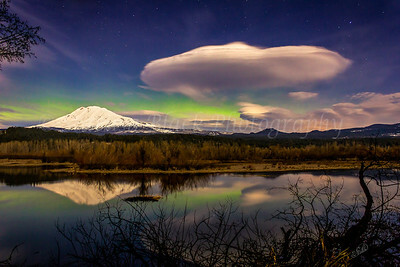 He once stated on evening news that the clouds had many names; lenticular, cloud caps, mountain wave clouds, even spaceship clouds. "And then... " he said, "there is Darlisa, who just calls them her Lennies!". Oh I laughed so hard that night. Over the years I have amassed a large collection of these remarkable cloud forms, but still no photo of the Aurora borealis until more recently. 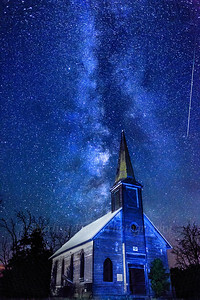 Lennies and Aurora became a general fascination that grew to include other cloud formations, images of lightning, rainbows, parhelia (sundogs), halos, and other atmospheric optics and weather phenomena. I have discovered a new favorite website on Atmospheric Optics, which is full of info on rainbows and halos, and other such beauties. Recently I joined the Cloud Appreciation Society in the United Kingdom, got me a little certificate promising I will "henceforth seek to persuade all who'll listen of the wonder and beauty of clouds" No problem, I have been doing that for a long time! Now I can pin a lovely badge to my lapel showing I am a member. 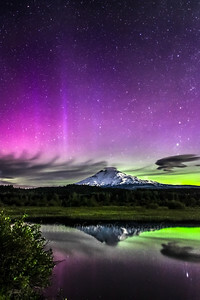 For the last few years, I have had images published in the annual Weather Guide Calendar by Accord Publishing, and Cliff Mass who is the atmospheric scientist at UW used one of my original 2007 lenticular stack shots in his weather book, "Weather of the Pacific Northwest" by Cliff Mass. Also some of the large Lenticular formations were published in the international paragliding magazine, "Cross Country Magazine"